View all buildings with commercial production kitchens. The Grand Teton Buildings (#1) @ 3137 NE 82nd Ave.
View all buildings with professional office space. View all buildings with retail suites. View all buildings with light industrial space. A suburban area just west of the city of Portland, Beaverton is slated to rival the city of Portland as a "foodie" destination. In mid-2015, the city of Beaverton announced it would allow food-cart-pods, thus inviting entrepreneurs and specialty-food-manufactures to expand their business to the west side, while still taking advantage of the easy access into downtown and the east side of Portland. Contact Matthew Schweitzer today @ (503) 525-1925 to view! 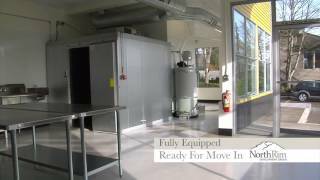 Commercial Kitchens	B 1,150 RSF *LEASED - Call for Availability* - Fully-Equipped Beaverton Kitchen just off Hwy 217 ~ For Rent Commercial kitchen space perfect for caterers, food-producers, wholesalers, and meal-delivery companies. Equipment includes: walk-in cooler, range, grill, oven, hood, work tables, & sinks. On-site parking & signage available. Figures, dimensions, and descriptions on this site are estimates and approximations.